As we celebrate Easter this Sunday, I thought I would write about rabbit patterns. 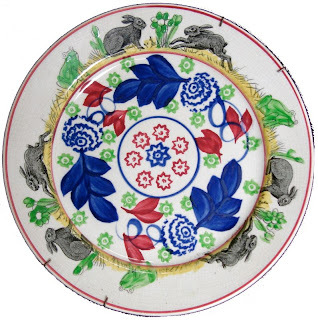 I have already written about rabbits and hares (see my posts on January 22, 23 and 26), so obviously I either like rabbits and their cousins the hares, or rabbits are popular transferware patterns. I think it is a little of both. Rabbitware patterns are a mixture of transfer print and stick or cut sponge decoration. The first plate is printed in brown with three rather angry looking rabbits and one frog. The grass and the frog are painted over the glaze in green or yellow. The border is stick sponge decoration (we did this type of printing in kindergarten) in the Virginia Rose pattern. The second plate shows black printed rabbits as well as frogs and flowers on the border. 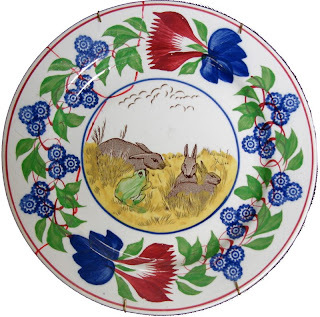 The rabbits are well printed, but the frogs and flowers are merely outlines that have been gratuitously painted green over the glaze. The center is a stick sponge Bullseye Variant pattern.